Shoot me an email (paulconnolly123@gmail.com) if you- or anyone you know- may be interested in improving their appearance for the big day since we're officially in wedding season! Get off the Meds with Exercise! It seems that exercise and moderate weight loss can solve A LOT of "problems" for people. I got the best news this afternoon when a client called me to say that due to his weight loss, he has been taken COMPLETELY off of his blood pressure medication. I told him it's just one less thing to worry about. One less co-payment every month. No more side effects. I love it! Keep up the great work Freddy! Train harder than everyone else- I often make it a point to check on my clients during their conditioning workouts (i.e. Step Mill machine, spin classes, etc...) as a means of supporting them. The one thing I'll often say to them is to always be the hardest working person in the room. I consider my clients all part of my team and it's vital they all work their tails off to show how determined they are to reach their goals. If you've ever seen Steve Nash play, you'll discover NO ONE will outwork him. This is what I need my clients doing. I'm happy to say they respond positively and their results show. 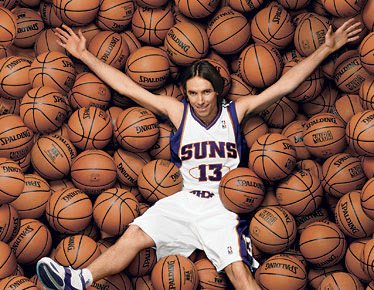 Implement restoration- Nash is well-known for diversifying his workout routines. He engages in various activities excluding basketball in the off-season to work different muscle group and movement patterns. Similarly, I often have my clients try new classes (i.e. I have a few people who just started a phase of Power Yoga and they are enjoying it). Additionally, many of my clients have incorporated massage therapy and chiropractic care to enhance recovery. Implementing a variety of training modalities will expedite recovery and enhance your workouts. Great job guys! I'm proud of you. Keep working hard. Today I'm a giving a big shout out to one of my former lifting partners Matt McCaffrey for sending me this squat video. It's actually a poem that was displayed on the wall of the first gym I belonged to when I was 15 years old ("Powerhouse Gym" in Watertown, MA). It was a dark dungeon kind of place where the "cardio area" consisted of 2 treadmills with dust all over them. I loved it and miss it big time. So much has been made lately in my industry about incorporating barefoot exercises, be it strength training or running. I'm historically skeptical anytime more and more people hop on board with any relatively new training methodology. Granted, barefoot training has been around for years, but it's now becoming more relevant in a lot of the crap people read at the checkout stands (i.e. Shape Magazine). Since the Book “Born to Run” was published, more and more people are hopping on the "barefoot bandwagon" and frankly, many people should not be. Strength and conditioning coach Nick Tumminello put it best in a recent article where he said "Here’s the problem – Yes… we are born to run. But, we are NOT born to run on concrete pavement! We are born to run on dirt, grass, sand, mud and other natural earth surfaces. All of which have a certain amount of “give”. Concrete however, has no “give” and will tear up joints if you don’t have some extra padding from a modern day running shoe. Plus, if you add in the fact that most folks who begin a running program are usually weak, slightly overweight, full of movement dysfunctions and are generally out of shape – running on concrete with no padding is a recipe for disaster! Remember – “Don’t run to get fit, get fit to run”. In this case, a better saying would be – “don’t barefoot run to get fit, get fit to barefoot run." I just read a great article from Precision Nutrition, my affiliate nutrition company whose products I often refer my clients to. Ryan Andrews essentially discussed the various types of sacrifice successful people have to make to achieve optimum results. It really made me think about not only my clients, but personal aspects of my life as well (i.e. training and nutrition improvements I know I could make). The successful CEO doesn’t always “like” taking on extra projects… but they “like” running the company and providing a reliable product/service. The sustainable farmer doesn’t always “like” staying in the fields until late at night… but they “like” showing up at the farmers market each week with crates full of fresh produce. The fit 50 year old doesn’t always “like” eating vegetables instead of chips… but they “like” waking up each morning without having to rely on prescription medication for high blood pressure. The person about to hit the beach doesn’t always “like” the idea of eating until 80% full… but they “like” how that bathing suit looks on them. The plant-based eater doesn’t always “like” ordering beans instead of steak… but they “like” knowing their food choices can improve the lives of animals. The stay at home parent doesn’t always “like” cleaning up after the kids, doing laundry and prepping meals… but they “like” raising a happy and productive family. The weekly volunteer doesn’t always “like” showing up with a smile on their face… but they “like” lending a hand and boosting morale at the dialysis center. The single person with a job doesn’t always “like” taking time to balance their finances and budget… but they “like” having enough money to afford food and housing. The young professional doesn’t always “like” putting 10% of each paycheck into savings and tithing 10% more… but they “like” the idea of retirement and karma. The athlete doesn’t always “like” going to practice instead of watching TV… but they “like” winning. The fit person doesn’t always “like” waking up for the morning workout… but they “like” the energy boost it gives them all day."